Carolyn Sampson and Ex Cathedra perform the rich, fulsome music of the French Baroque. This album showcases the works written for the premiere soprano of the day, Marie Fel. Voltaire called her his ‘adorable nightingale’. For d’Aquin, she was an enchanted being. Marie Fel held an entire generation spellbound at the Paris Opéra and at Louis XV’s court during one of the most glorious periods of French music. 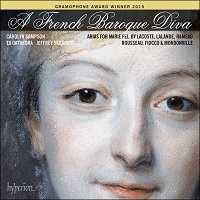 With a voice described as ‘pure, charming, silvery’ (La Borde), ‘touching and sublime’ (Grimm) and ‘always lovely, always seductive’ (d’Aquin), she inspired some of Jean-Philippe Rameau’s finest music and introduced a whole new level of virtuosity and expression into the French singing tradition. Her long, triumphant career is traced through this fascinating recording. “This is a brilliantly planned and executed, musically illustrated biography of Marie Fel, one of the great 18th-century divas and muse of Rameau, admired by the Philosophes and adored by Paris audiences … this is a programme that pleases as much today as it did in hers, guided by Graham Sadler’s beautifully crafted booklet-notes … Carolyn Sampson, in superb form, is joined here by the choir of Ex Cathedra, who sing with precision and clarity of articulation in a lovely bright acoustic … the longer we listen to Sampson’s voice, the more she seems to inhabit the aura of Fel, clearly a skilled and charismatic yet deeply affecting performer.” Gramophone Award Winner 2015.